These former Tahriris and followers of the ideas of Taqi al-Din al-Nabahi - in order to gain acceptance - are pretending to teach the "Salafi" aqidah from the books of Salafi scholars. Because these Kharijites are foolish-minded and newly-arisen and ignorant of many aspects of aqidah - [historically, the Kharijites,, entered into many innovations in addition to their original innovation, indicating their ignorance] - their mistakes are abundant and apparent for all to see. In the lecture above Abu Waleed (Shahid Janjua) pretends to teach the madhhab of Ahl al-Sunnah in the Sifaat, pretending he has understood the foundations, and in the course of this, he speaks of Ta'weel, Takyeef and also Tafweed, offering their definitions. OK, point number 6 is tafweed. Tafweed is basically, my dear brothers, the crime which is committed by the majority of the deviant sects today, which is like the Maturidis. So they are the people who say, you know for example, Allaah is everywhere, these type of things. Allaah He could be like this or he could be like that. So tafweed, or Mufawwidah, tafweed is "open to interpretation", "open to interpretation." First, tafweed is not a crime committed by the majority of the deviant sects today, that's factually incorrect. Second, and more importantly, the retard defines tafweed as "open to interpretation" when it is in fact "to claim ignorance of the meaning and to relegate its knowlege to Allah" - tafweed is essentially treating the texts of the attributes as if they are a foreign language that one does not understand. If this pretender had actually studied the Salafi aqidah objectively and sincerely instead of using it as merchandise (which he has corrupted and doctored in any case) with which to hoodwink others and legitimize the Takfir and Kharijiyyah he is concealing behind the merchandise, he would have known this. The people of takhyeel (imagination): From the Heretical Philosophers and the Baatiniiyyah, those who say that the Messengers informed about the affair of faith in Allah and the Last Day with what opposes the actual reality so that they may cause the masses to imagine (unreal) things which would benefit them (in the worldd) and they consider this to be from the virtues of the Messsengers, and I have refuted those in detail in other than this place. The people of tahreef and ta'weel: Those who interpret the speech (of the Messegers) upon (a way) that opposes their intent, and they claim that they (the Messengers) intended that meaning, alongside (the fact) that there is nothing in their speech which indicates that they (the Messengers) intended that meaning, rather their speech indicates that they inteded other than it (the figurative interpretation). The people of tajheel (ascribing ignorance): Those who say that the speech [regarding the attributes] does not have any meaning known by the Messenger or other than him. Only Allah alone knows it. The last two groups mentioned by Ibn Taymiyyah are the people of ta'weel and the people of tafweed respectively. The people of tafweed do not say - as the Takfiri pretender alleges - that the texts are "open to interpretation", rather they say that the texts do not have any meaning whatsoever that is known by anyone in the creation, so they ascribe ignorance to the Messenger (sallallaahu alayhi wasallam) and the Companions (radiyallaahu anhum) - that is why they are referred as people of tajheel (because they impute ignorance). So tafweed is to claim total ignorance of the text and has nothing to do with any type of interpretation. Number four is an easy one, you have heard this word before, "Ta'weel", this is also known as "Takyeef" but ta'weel is enough, "false interpretation", like trying to explain the essence of the Sifaat, "false interpretation", taw'eel. This Takfiri Khariji pretender and more importantly the audience sat in front of and being deceived by him should know and understand that ta'weel is not "also known as takyeef", and this would be an incorrect way to present the issue. Rather, a person who makes ta'weel (figurative explanation) - as a result of this approach falls into a number of things as a consequence. 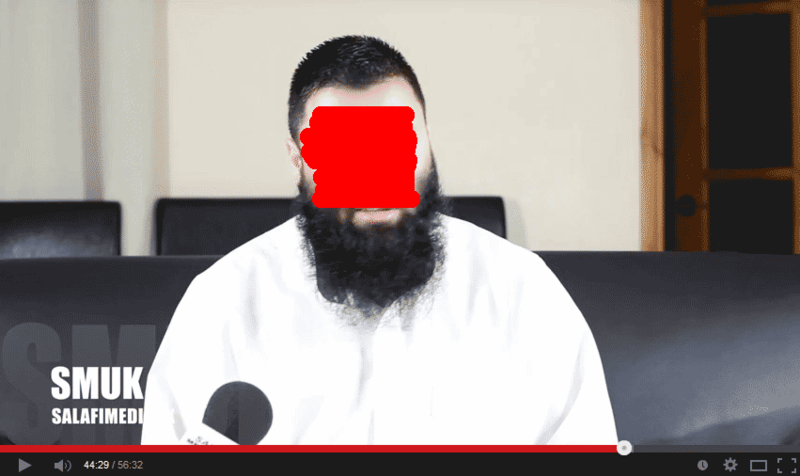 First, he is distorting the speech of Allaah, the Exalted (making tahreef). Secondly, the thing which he fled from (making takyeef), he actually fell into it, because his ta'weel can be considered, in many cases, a specification of the how (takyeef). Thirdly, it is speaking about Allaah, the Exalted without knowledge, and so on. So it is not correct to say "tahreef is also known as takyeef." A genuine Salafi, who has studied from and with Salafi scholars, would understand and know this and would not present the issue like this. The moral of this story here then is that foolish-minded Takfiri Kharijite pretenders, faking Salafiyyah, wearing its gown, expose themselves for the thieves and charlatans they are by their own speech and action. As soon as you ascribe to and lay claim to Salafiyyah, you have opened yourself for scrutiny and evaluation by the very criterion you are claiming to ascribe to (Salafiyyah). This is why Dumb Takfiris like Abu Walid Shahid Janjua do not make very good criminals as we explained in more detail in Part 4.